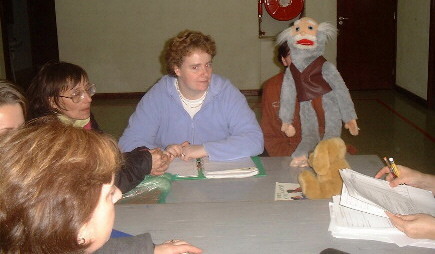 In October 2000,St.Edward's joined the Department of Education and Science's Home School Community Liaison Scheme. One of our teachers, M�ire Hunt, left the classroom to work full-time as our Home School Community Liaison Co-ordinator. Since then, a lot of strange things have been happening!!!! Twenty five parents in our school have participated in a course called "Read to Succeed". The "Read to Succeed" course is accredited by the Open College Network in Northern Ireland. Our course is now part of a pilot programme for NCVA accreditation in the Republic of Ireland. It is being developed into a 16 week programme on Early Childhood Reading which will form part of the core curriculum for NCVA's Childcare Qualification. The course that we have been involved in, engages parents in an exploration of how young children learn to read. It looks at the theory of early childhood language development and at how reading is taught and learned. Parents learn to read to stories to young children, using props and designing follow-up activities, and then they put their learning into practice by reading to the infant classes in the school. They examine a wide variey of children's books and then they "create" a book for children aged 3 - 6 years. They also do an essay that brings together the theory and practice from the course with their own experience of reading and rearing children. This course has been a great success in St.Edward's. Most of the participants were early school leavers themselves and the prospect of writing an essay was daunting to them. But we have a great tutor, who really believes that this course must be accessible to parents whose experience and wisdom in child rearing is far more important than their level of literacy or their educational qualifications. The work that the parents have produced, their resourcefulness and determination to complete asssignments has amazed everyone in our school community. And the impact of their storytelling sessions in our classrooms has been incredible!! !